ISKCON Temple of Delhi is well established Vaishnav Temple of Lord Krishna and Radharani. The Deities of Lord Krishna and Radha are termed as Radha Parthasarathi. 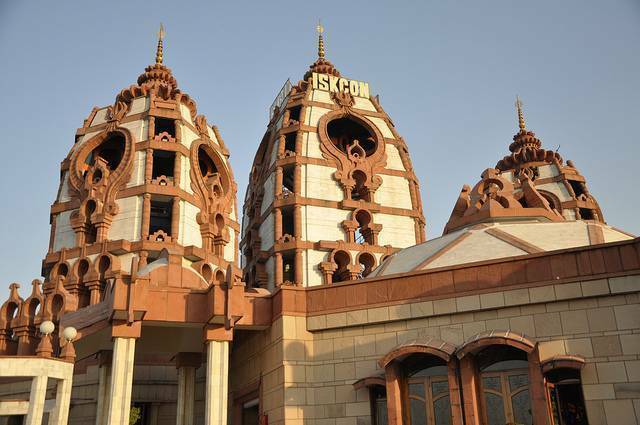 Situated in East Kailash Area of New Delhi, ISKCON Temple was established in 1998. The brain child behind this massive temple complex is Achyut Kanvinde. ISKCON Temples are opened in various part of India. One can see several rooms for Pujaris (preists) who perform Poojas and Aartis following strict rituals and regulations. Six Aarti’s performed are Mangala Aarti, Tulsi Aarti, Dhoop Aarti, Raj-Bhog Aarti, Pushpa Aarti, and Sandhya Aarti. The attires of deities are changed twice every day. Main temple hall remains closed between 1PM - 4PM and from 9PM to 4:30AM.